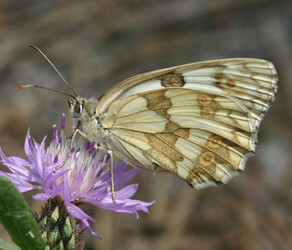 For the time being, the subtribe Melanargiina contains only the genus Melanargia. This is an unusual genus of satyrines–the adults are white with contrasting black wing veins and markings. Melanargia is distributed from Europe and north Africa to Japan. The hypothesis of relationships is based on the phylogenetic analysis of Nazari et al. (2010). All currently-recognized species, as well as some taxa formerly considered species but now reduced to subspecific status, are retained on the tree for clarity. Note that while Nazari et al. employ the generic name Halimede Oberthür & Houlbert, 1922 as a subgenus, the name is an invalid junior homonym. Nazari, V., Ten Hagen, W.,Bozano, G.C. 2010. 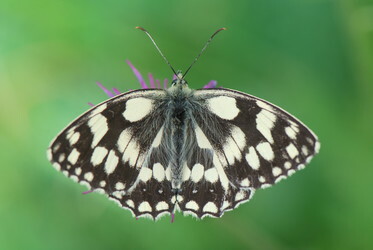 Molecular systematics and phylogeny of the 'Marbled Whites' (Lepidoptera: Nymphalidae, Satyrinae, Melanargia Meigen). Systematic Entomology 35: 132-147. Page: Tree of Life Melanargiina Wheeler 1903. Melanargia Meigen 1829. Authored by Andrew V. Z. Brower. The TEXT of this page is licensed under the Creative Commons Attribution License - Version 3.0. Note that images and other media featured on this page are each governed by their own license, and they may or may not be available for reuse. Click on an image or a media link to access the media data window, which provides the relevant licensing information. For the general terms and conditions of ToL material reuse and redistribution, please see the Tree of Life Copyright Policies.